Founded in 1992, the CBSQ was established by four Presidential Performing Arts Scholarship students from The George Washington University (GWU). Today, the group is composed of talented alumni of GWU and other local universities. CBSQ is unique among area quartets due to a finely tuned mixture of classical experience, personal interaction with clients, musical talent, and professional artistry. There is nothing more important to us than learning exactly what you envision for your event and fulfilling that need for you. We bring excellence from the planning stage to the performance stage. April Maddox received a BA in Music and Political Science from The George Washington University (GWU) in 2000. She then attended The Catholic University of America’s Columbus School of Law and earned a JD in 2003. A native of Salt Lake City, April played with the Utah Youth Symphony. She also served as principal cellist with the Rocky Mountain Camarata (which toured the Western United States each year), the Jordan Youth Symphony, the Utah All-State Orchestra, and the Brighton High School Orchestra. April has scored superior ratings in the Utah State Fair, Melba Lindsay Burton, and Utah State Solo and Ensemble String Competitions. While a student at GWU, April served as the principal cellist of the GWU Symphony Orchestra and performed in a number of chamber ensembles. She was also a member, and frequent vocal soloist, with the GW University Singers. April was selected to perform on the Student Honors Recital for four consecutive years and was also awarded the George Steiner scholarship for string players and the Barry Manilow scholarship for excellence in music. During the course of her four years at GWU she studied cello with Professor Nancy Snyder, voice with Dr. Robert Baker, and piano with Professor Malinee Peris. April is currently employed as an attorney for the Department of Veterans Affairs, Board of Veterans’ Appeals in Washington, DC. 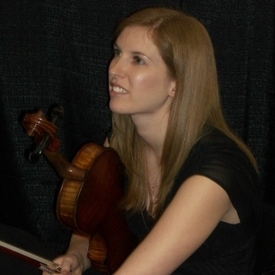 She, her husband Joel, and their twin sons, Paul and Ben, live in Arlington, VA.
Erin Ryan, second violin, graduated from the University of Mary Washington in 2004 with a Bachelor of Arts in Music. She served as the concertmistress of the Mary Washington College-Community Symphony Orchestra in 2003-2004 and performed at Carnegie Hall in 2002 with the Mary Washington Symphony. 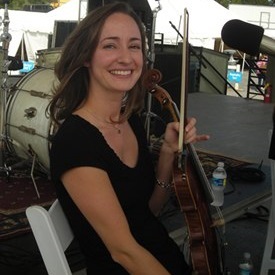 Erin grew up in Manassas, VA. During high school, she performed with the Youth Orchestras of Prince William and was accepted into the All-Virginia Symphony Orchestra from 1998 to 2000, as well as the North Central Virginia Regional Orchestra and All-County Orchestras. While attending Mary Washington, she was the recipient of numerous music scholarships including the Aurelia B. Walford Scholarship and the Baker Orchestra Scholarship, and received the Mu Phi Epsilon Sterling Achievement Award. She also had the honor of performing in a master class for the renowned composer George Crumb. Erin studied with Edwin S. Johonnott, former first violinist with the National Symphony Orchestra, both in high school and at Mary Washington. Erin teaches privately to a studio of 40 violin and viola students. Over the past several years, she has expanded her playing to other genres such as folk and rock music. Erin regularly performs with her rock band The Beanstalk Library at DC-area venues such as The Hamilton, Pearl Street Warehouse, and the Rock & Roll Hotel. She earned her Master of Education in School Counseling from George Mason University. Erin resides in Alexandria, VA with her husband. 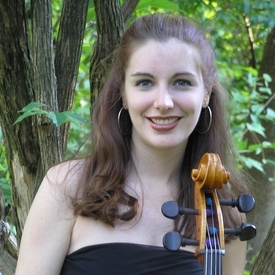 Kristen Wall joined CBSQ in 2018 and shares the viola seat with Julia. She has more than 23 years of ensemble experience playing violin and viola. Kristen graduated from Princeton University with a major in Politics and a minor in Chinese Language and Culture. While at Princeton, she played viola and violin in the Princeton University Orchestra, which performed on tour at European venues in Barcelona, Madrid, London, and Edinburgh. 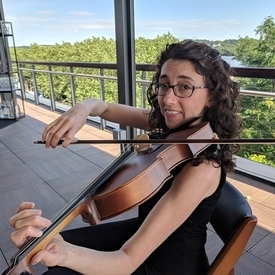 Under coaching by the Brentano String Quartet, she performed in several chamber music ensembles, including the Princeton University Orchestra String Quartet. She has attended and played in chamber ensembles and orchestras at the Sewanee Summer Music Festival and the Chautauqua Summer Music Festival, and recently performed at the Apple Hill Chamber Music Workshop. Her orchestral experience includes playing with the Notre Dame Symphony Orchestra and the Asheville Symphony Orchestra. Kristen shares her love of music with her young students at Georgetown Montessori School. Prior to becoming a Montessori teacher, she worked in international development and peace and conflict studies at the University of Notre Dame. Kristen lives in Northwest Washington D.C. When not playing the viola or violin, she enjoys singing in the Congressional Chorus, biking, and swing dancing. Julia McDowell graduated from The George Washington University (GWU) in Spring 2003 with a Bachelors of Business Administration in Marketing and Entrepreneurship. She attended GWU as a Presidential Performing Arts Scholar and studied with former National Symphony Orchestra violist, Richard Parnas. Julia grew up in Centreville, Virginia. During her four years of high school, she was principal violist in her Symphony Orchestra and Chamber Ensemble and studied with Jennifer Cline, violist in the National Symphony Orchestra. Julia participated in Northern Virginia Regional Orchestra and the All-Virginia Symphony Orchestra during her junior and senior years in high school. Notable performances include a concert in the newly-renovated Concert Hall in the Kennedy Center and one of three solo performers at her Senior Year Symphony Finale concert. While at GWU, Julia performed with the GWU Symphony Orchestra, numerous ensembles and in pit orchestra of the performance of Into the Woods. She also was invited to play in several Student Honors Recitals. Julia is a marketing and advertising strategist and runs her own company, Five Ones. She lives in Fairfax Station, VA with her husband, three children and dog. Sinbat Siraseranant, first violin, has over 23 years of music ensemble performance experience in the violin and viola. Growing up in Northern Virginia, he has participated in many ensembles throughout the Washington, D.C. Metro Area including the Washington Conservatory School of Music, the Annapolis Symphony Orchestra, the National Symphony Orchestra, and the American Youth Philharmonic, where he sat as an associate principal violist. Throughout his musical career, Sinbat has received many honors and recognitions. He was chosen to perform with the NSO. This recognition along with his dedication to music earned him the National School Orchestra Award in which he was voted as the most talented individual in his high school senior class. 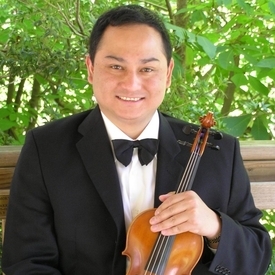 During college years, Sinbat was selected by the George Washington University music department to perform various solo viola compositions accompanied by his ensemble coach, Malinee Peris, for the university’s Honors Recital. He has studied with Richard Parnas who was a principal violist of the NSO. Sinbat was the principal violist of the GWU Symphony Orchestra from 1994 through 2004. Academically, Sinbat attended GWU and earned his BS in Biology and minor in Music Performance in 1997. After working for several years in the field of business for notable companies including Northrop Grumman, Boeing and Booz Allen Hamilton, he went on to graduate with honors and obtain his MBA from the GWU School of Business in 2004. Today, Sinbat is a certified Project Management Professional government civilian supporting Defense Information System Agency.